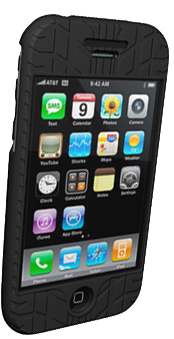 Time to check out ifrogz’s contributions, case-wise, for the iPhone 3G. 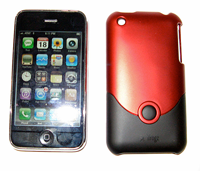 For those who are looking for sporty, hard-style case to keep their iPhone 3g protected in, take a look at ifrogz’s Red/Black Luxe Case. The Luxe is a hard plastic case with a two-tone finish, in this case, red and black, that offers a more up-to-date modern look to your iPhone 3G. For those iPhone users who have no wish to carry their iPhone on their belt, and feel totally cool with it in their pants or coat pocket, ifrogz’s Luxe case just adds a little bit more style and helps keep the back of your iPhone from scratching up. Light-weight and yet thin so as to not add additional heft, the Luxe case allows you to add a dash of color and pizzazz without going overboard. Evaluating the Luxe case, the first thing that one discovers is that the case is precise in build, if nothing else. Placing the two halves together one needs to make sure that the two fingers on the bottom piece, one on each side, have to slide into the top piece exactly or the case is not secure. Once you have the two sections together, the case does a great job of protecting your iPhone from scrapes and scratches on the back side. On the inside of the case, there is a velvety material feel that helps in preventing any scrapes from occurring. The case also comes with the front screen protector film that helps cut out the greasy finger tip effect and the also included microfiber cloth removes oil and dust. Now, after evaluating ifrogz’s Luxe case, I decided to try something just a little bit different this time around. 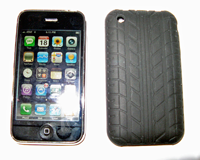 Their Treadz case, which can best be described as a rubber suit for your iPhone, designed to look like a tire, treads and all, offers another version of protection for your iPhone 3G.It comes in basic black only, feels like you’re holding a flat tire rubbery surface in your hand and it won’t slip out of your hand. Just as in the Luxe case, the Treadz silicone case comes with the clear plastic screen protector to protect the front of your iPhone from scratches and a microfiber cloth to clean the iPhone off. Placing your iPhone in the Treadz case after you’ve placed the screen protector on, well, consider it about the same as putting on a wet suit. The case provides some stretch and you’re able to slip it over the unit. There are no problems with accessing any of the buttons or switches on your iPhone, although you will feel that there is some depth to getting to the home switch on your iPhone. It’s like trying to place your finger in a hole that is just a tad bit smaller than the size of your finger. You can still access it, but it will take you a little bit of getting used to it. There were no issues with listening to any phone calls or in listening to music. I was concerned for a brief second when I looked at the opening for the camera lens but discovered that there were no problems at all in taking any pictures. Another interesting item about the Treadz case is that ifrogz states that it is treated with a proprietary anti-dust technology to help it repel lint and dirt. If you’re going to keep your iPhone in your pocket, this may not be a bad idea after all. If you are looking for a flashy case, this is not it. This is a case that is going to provide you with a durable product designed to protect your sizable investment in your iPhone. This case will not fall out of your pocket, it won’t slide across the desk, yet it will give you more bang for the buck. So, if you’re not interested in glitz or showing off, then ifrogz’s Treadz case for the iPhone 3G is for you. Pro: Lightweight, yet protective of your iPhone. Included in the package is a microfiber cloth and screen protector. Case does an excellent job of protecting your iPhone from scratches and the small bumps. Pricing is very reasonable. Overall, a very nicely thought out minimalist case. Cons: No belt clip. Comes in basic black.